Christian Connection received a Highly Commended award at the 2016 UK Blog Awards ceremony. This year’s UK Blog Awards ceremony held at Park Plaza, Westminster, brought together some of the best and brightest bloggers from across the UK. 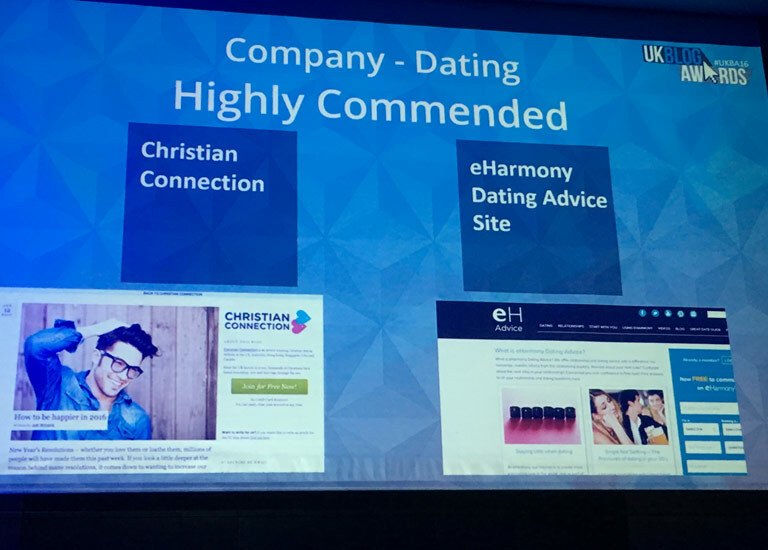 Christian Connection beat off competition from other blogs including Guardian Soulmates, Urban Social and Hey Saturday (to name a few) in the category Company Dating Blog of the Year to win Highly Commended Dating Blog of the Year alongside eHarmony, coming second to Toyboy Warehouse. This commendation follows two awards from the UK , including Daters’ Favourite Dating Site and Best Niche Dating Site 2015. Since the very first blog post in February 2013, we’ve published hundreds of articles on dating, faith and singleness. We would like to take this opportunity to say a huge thank you to all of our wonderful bloggers who have contributed over the past few years and made it what it is today. See the full list of finalists on the UK Blog Awards website here. If you’re interested in writing an article for Christian Connection find out how. Joff is part of the Christian Connection team and the Editor for this blog. He oversees marketing, communications and customer service.